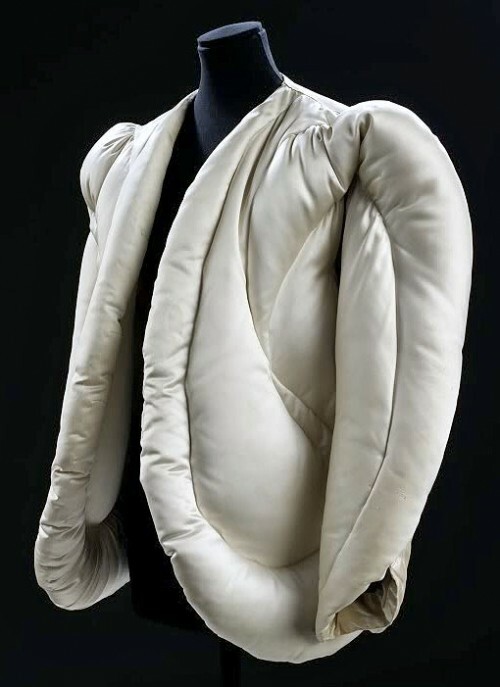 British-American fashion designer Charles James is most famous for his elegant, bias-draped gowns, but he was also the first to propose an evening puffer. Designed in 1937, James’s topper is a dramatic swirl of cinching and structure in dove gray; it now inhabits London’s Victoria & Albert Museum. Helmut Lang’s artful, urbane utilitarianism elevated everyday garments like ribbed knits and oversize anoraks to haute status. For Fall ’98, Lang produced some of his most memorable outerwear, including this lemony cream puffa draped off the back of Kirsten Owen. Martin Margiela’s duvet coat from Fall 1999 was a riff on Kamali’s sleeping bag number, repurposing a household item into a fashion garment. His came in subtle patterning with detachable sleeves so wearers could unhook the sleeves and use the coat as an actual duvet. In the late ’90s, the Tommy Hilfiger puffer was inescapable. Rappers wore it. Actors wore it. Aspen-goers wore it. Hilfiger’s red, white, and blue logo was the symbol that winter had arrived. John Galliano’s Fall 2002 Couture collection for Dior was inspired by a road trip across America and Mexico, where the designer likely saw his fair share of puffed-up outerwear. In signature Galliano fashion, however, his final product looks nothing like the coats you’d see in the American heartland. For Fall 2004, Junya Watanabe crafted an entire collection of puffed-up pieces. There were dresses, jackets, wraps, and shrugs, none more memorable than this tangerine outfit made entirely of down-filled fabric. The thin, sporty puffers from Moncler were an early-to-mid-aughts hit. Worn by celebrities and shot in the pages of Vogue, the jackets were the statement outerwear for the upper crust. Today, they’re experiencing a resurgence courtesy of Drake’s 2015 “Hotline Bling” video. Mrs. Prada tends not to favor a voluminous jacket, but she made an exception for her Pre-Fall collection in 2010, showing this check puffer with red shearling lining. Nicolas Ghesquière has never conformed to norms, so when he did puffers at Balenciaga for Fall 2010 he did them on his terms. That meant monastic white tops with black yokes and caped sleeves paired with eyelet minis and bare legs. Inspired by synthetic glamour and the late-’80s flick Cruising, Christopher Kane dreamt up a moiré fabric for Fall 2012 that he used for one of his only puff coats to date, and maybe one of the sleekest puffers ever. Riccardo Tisci turned his eye to basketball culture for Givenchy’s Fall 2014 menswear collection, ribbing and striping bomber jackets with the patterns of basketballs. 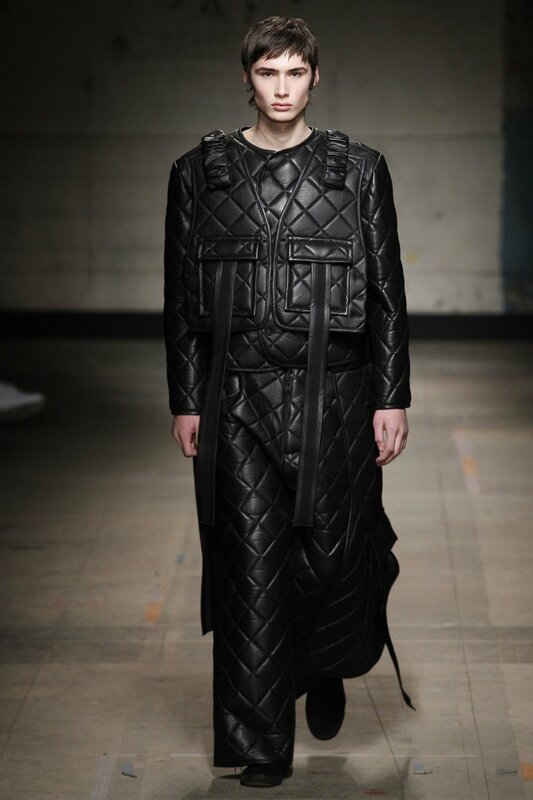 Tisci gave his jackets a little extra volume courtesy of a down lining. Miuccia Prada’s twisted take on ski culture for Miu Miu’s Fall 2014 show included a range of quilted jackets in peppy colors worn with matching skirts. Think school-girl-meets-ski-chalet with a touch of Sky Ferreira. Among the parade of extravagant coats in Chitose Abe’s Fall 2014 Sacai collection was this gorgeous white puffer with shearling trim. Chances are, in this coat, you’d never be cold again. Jeremy Scott’s homage to New York culture included an opening series of primary-colored puffas that echoed NYC’s ’90s streetwear scene. 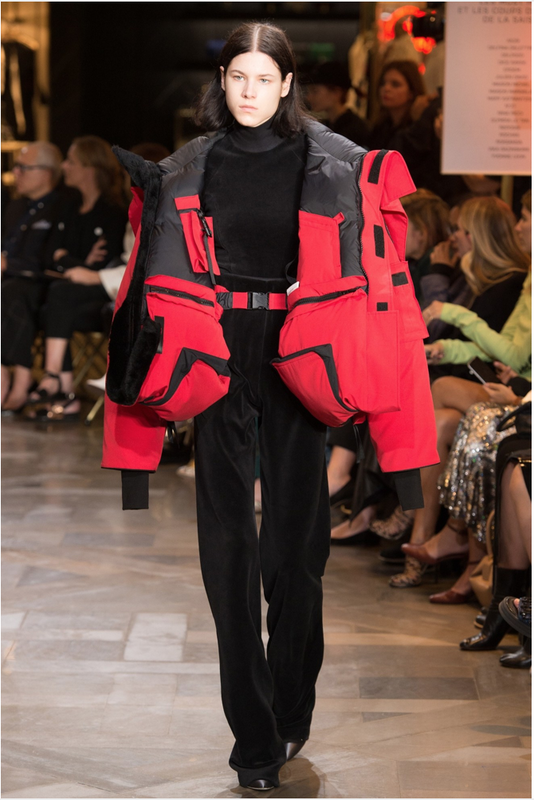 Not to be outdone by his own Balenciaga collection, Demna Gvasalia teamed up with Canada Goose over at Vetements for this utility-driven red jacket. About a quarter of Craig Green’s Fall 2017 collection was comprised of slightly puffed pieces. Watch this space next fall to see who wore them best.